South Brisbane Cemetery was established at the height of the Victorian-era fascination with monumental cemeteries. Middle-class families were expected to spend as much as they could afford on grave monuments appropriate to the social status of the deceased. The graves of paupers often went unmarked. Some early headstones have been lost to time, falling over because of storms or old age, but many of these fascinating monuments to our ancestors remain and effectively make the cemetery something of an open-air art gallery. The headstones of South Brisbane Cemetery feature a huge array of different decorative carvings. Read here to find out what these symbols mean. Can you identify various styles of headstones and their component parts? Learn about the different parts of cemetery headstones here. Some do's and don't's for cleaning graves and headstones at South Brisbane Cemetery and avoiding causing any damage. South Brisbane Cemetery opened in 1870 but some of the people interred there died years before then. Read here to find out why their graves are in the cemetery. How many of these different types of cross can you find in the South Brisbane Cemetery? 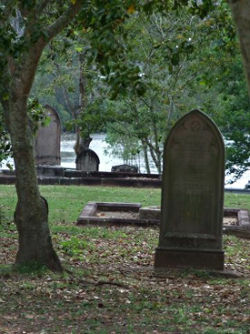 The headstones in South Brisbane Cemetery face a number of threats, and each year their number decreases. Learn what the threats are what can be done about it. Learn about a unique historical marker in the South Brisbane Cemetery on the graves of the people executed at Boggo Road prison during 1883-1913. There are many special headstones for military personnel throughout the South Brisbane Cemetery. Find out about the different types here.